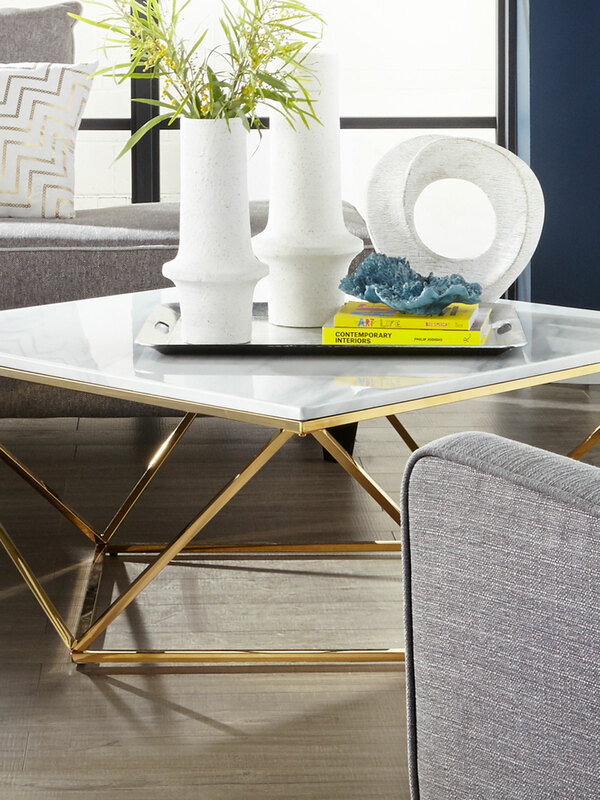 Whether the state of your coffee table is a dumping grounds or just bare bones, you can easily elevate your living room aesthetic by styling your coffee table with a few simple tricks. Here are eight easy tablescape design tweaks that will turn a standard-issue coffee table into a living room standout. Whether it’s a trio of hammered brass bowls, or a set of five potted succulents, odd numbered groupings are more visually appealing than even numbered ones. Just go with it. Or showcase one solitary, statement-making piece, such as an epic tall vase. Introduce rustic to refined with a live-edge wood coffee table and linen-covered sofa. Furniture pieces don’t have to match to complement one another. A tray brings versatility to dual-purpose furniture. An ottoman becomes a coffee table when you put a tray on top. Remove the tray whenever you need extra seating. If your room is designed around larger, weightier furniture pieces, keep your coffee tablescape light and uncluttered, so it doesn’t compete. Loaded with coffee-table books? Stack them low, but juxtapose the covers for an interesting twist. Whether you’re a crafter, a traveller, a hand-me-down fiend (or all of the above), don’t forget to weave sentimental treasures into displays from time to time. You’ll smile every time you look over! There’s no rule that says you can only have one. Consider a pair of ceramic stools tables or a set of nesting tables. Avoid displaying votives that are identical in size, or potted plants that are all the same height. To ensure overall balance in your table display, mix it up – and remember to group displays in odd numbers.